Upon arriving at the office today, the first thing I did was look at the artwork and assess if they would work in the office. Both pieces were stunning. 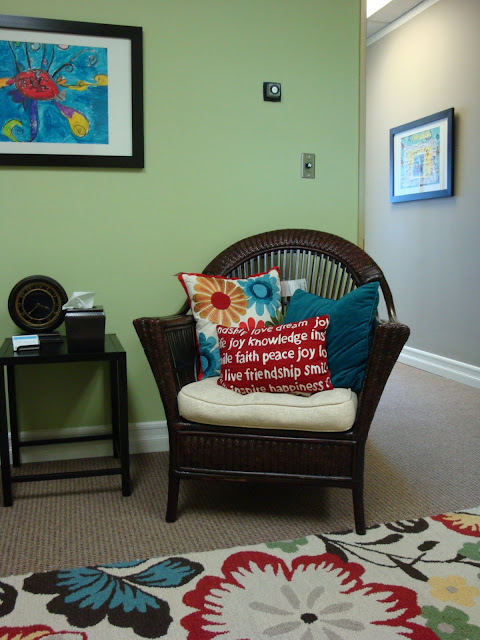 The first piece that we placed in the reception area was painted by an artist named, Le Thanh Son. Le Thanh Son was born in Hanoi in 1961 and graduated from the Hanoi College of Drama and Cinematography in 1986. His primary medium is oil on canvas. Son is a well respected artist and is famous for his distinct impressionistic style. He takes pleasure in filling his canvases with clear, bright colors and is well known for the interplay of light and shadow in his works. His works often depict life in Hanoi and in the surrounding villages. Le Thanh Son's work is widely exhibited throughout Asia, Europe, Australia and North America. He has received numerous honors and awards and his paintings are held in public and private collections worldwide, including that of former US President Bill Clinton and Microsoft founder, Bill Gates. 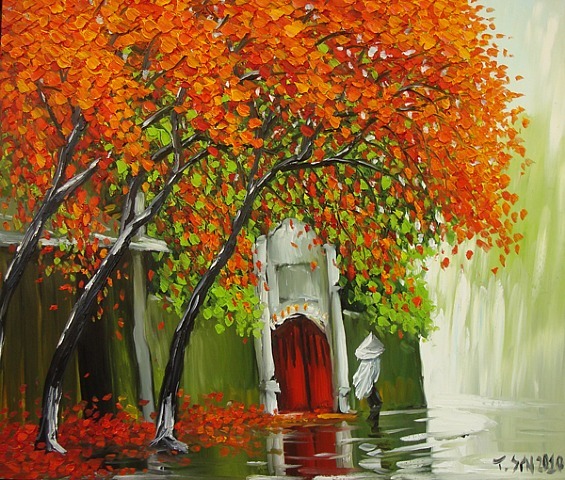 The second piece was painted by Hong Viet Dzung. Hong Viet Dung was born in 1962 in Hanoi. He graduated with a degree in painting from the Hanoi Industrial College of Fine Arts in 1984. His paintings often depict figures standing in solitude, sometimes holding simple objects. He uses pale and distinctly muted colors to bring a sense of calm to his works. 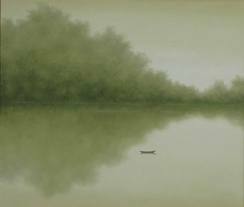 Dung is a devote Buddhist and conveys his meditations in his paintings. He brings only the essentials into the foreground allowing the observer to use them as a stage for creating his or her own images and reflecting upon them. Dung produces a very limited number of works annually and his works are highly sought. He has exhibited around the world and his works are in the permanent collection of the Vietnam Fine Arts Museum. I had to move the furniture around to make room for the large pieces of art. Hanging them made a huge impact in both the rooms. After the art was placed I assessed what I needed to complete the room. I made a mental note (rugs, small benches, a small round table, new pillows to freshen it up ...) and ran up to the client's local Target. On my way I discovered (via my blackberry) that there was a Pier One Imports just down the street. I quickly shopped and came back and placed my new purchases. The two large pieces of art were a very generous gift to the client from a long time friend of hers who had purchased them overseas. They turned out to be the perfect inspiration pieces for each of the rooms - one bright and vibrant; the other calm and muted. The art made a huge difference in the office and each one turned out to be just perfect for the rooms where they were hung. A few small pieces of furniture and some fun new pillows were all that was needed to create this perfectly finished office. A text from my client was the perfect ending: "Sherri you absolutely rocked today. You have created an incredible office space. Thank you so much for all that you did for me today." Seriously! Does it get any better than that? Sherri, the office looks amazing! I am sure she is thrilled! I am partial to the blue room vignette, rug, and artwork. The color on the wall is so pretty. The art on the wall is stunning, too. Unbelievable how well the added art pieces worked so well with what you already did for her. One room is so calm & serene and the other just pops with fun. I love the little red pillow! Great job!!! REally love the blue room too....and that painting in there is stunning. It looks great, Sherri! Beautiful job!